OAKLAND, Calif.—Kamala Harris was challenged to turn out as big a crowd as Barack Obama did when he came to Oakland's Frank Ogawa Plaza during his first campaign, and she delivered with a crowd estimated at over 20,000 to watch her launch her presidential bid. Donna Gibbs, an Oakland attorney who was in attendance for both Obama's 2007 event and for Harris on Sunday, immediately noticed that Harris drew a much bigger crowd. She said it had less to do with excitement for Harris and more to do with the desire to defeat President Donald Trump. "Back then it was just the die-hards," Gibbs explained. "Now people are a lot more energized than they were in 2007, because our country is literally being destroyed." Gibbs is yet to get behind any particular candidate, but says her top priority is the ability to beat Trump. "I just want the best candidate, because the alternative is so insane," she said. "I just want somebody who can win." Harris aimed to show on Sunday that she would be the party's best option, stressing the importance of the decision voters face in the Democratic primary. "We are at an inflection point in the history of our world, and we are at an inflection point in the history of our nation," Harris said. " We are here because the American dream and our American democracy are under attack and on the line like never before." While she didn't pull any punches when criticizing the Trump administration’s policies on taxation, immigration, and foreign policy, she aimed to position herself as a unifying candidate, remarking that Americans have "much more in common than what separates us." "People in power are trying to convince us that the villain in our American story is each other," Harris said. "But that is not our story, that is not who we are." "The United States of America is not about us versus them," she said. "It’s about ‘We the People.'" She also surprised some with a populist economic message, arguing that the current economy "is not working for working people" and promising the "biggest tax cut in a generation." "We'll pay for it by reversing this administration's giveaways to the top 1 percent," she said, echoing the messaging of Senate colleagues Elizabeth Warren and Bernie Sanders, who both are also running for president. Gibbs wasn't alone in her reluctance to commit to Harris so early in the primary process. Joseph Ham, who came to the event from nearby San Francisco, said he and his friends came because of the "high level of curiosity" about the field. "It would be crazy to commit right now," Ham said. "These candidates all have a year to try and speak to me." Yolanda Williams, who was born and raised in Oakland and came to the event with her 18-year-old daughter, said she is closer to supporting Harris after seeing her speak, but wouldn't commit. "My deciding factor is still going to be the ability to beat Trump, but I'm totally all in on what she had to say today," Williams said. " It was an aspirational speech, a unity speech." "For me it's between her and Elizabeth Warren, but she absolutely helped her case today," Williams said. While Harris attempted to strike a unifying tone during the speech, Republicans say her choice of Oakland is a telling sign for what kind of campaign she will run. 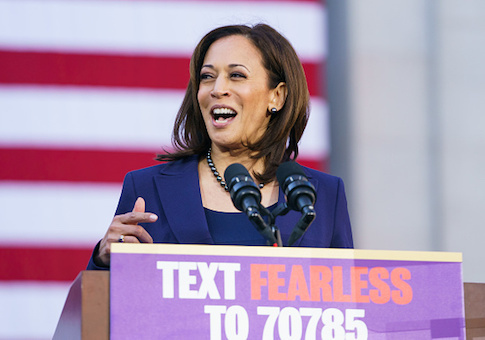 "It’s fitting that Harris chose the most liberal district in deep-blue California to launch her campaign," said Michael Ahrens, a spokesman for the Republican National Committee. "Government-run health care, weaker borders, and higher taxes might be popular there, but her liberal policies are totally out-of-step with most Americans." Harris was born in Oakland and spent part of her childhood there, before moving to Canada with her mother. She took a job as a prosecutor in the city in 1990 after graduating from law school. Harris will work to keep her momentum going on Monday as she travels to Iowa for a townhall hosted by CNN's Jake Tapper. She was in South Carolina, another early primary state, on Friday.